Searching for breeze and pressure on the race course was a game of snakes and ladders for young competitors at the Renaissance Re Junior Gold Cup today. While grappling with the need for patience and consistency – two requirements for sailing well in light air – many sailors were tested during the third day of racing on Bermuda’s Great Sound. First and second place did not change after nine races with Christian Spodsberg of Denmark in first place with 32 points, Bermudian Adam Larson in second with 42 points while Joao Emilio Vasconcellos of Brazil is in third place with 46 points, followed by Rocco Falcone of Antigua with 47 points. Since arriving in Bermuda, many of the international sailors have now experienced strong winds on the Sound and light and shifty air that mean conditions yesterday were particularly frustrating. “The shifts were appearing out of nowhere as if they were here and they were there,” said Julia Szmit of Poland who is currently in 11th place. Payton Thompson of the USA, who is the top girl in the regatta agreed that “the air was light and unpredictable today” but overall says she is having a great regatta. “I love it here in Bermuda,” Thompson said. 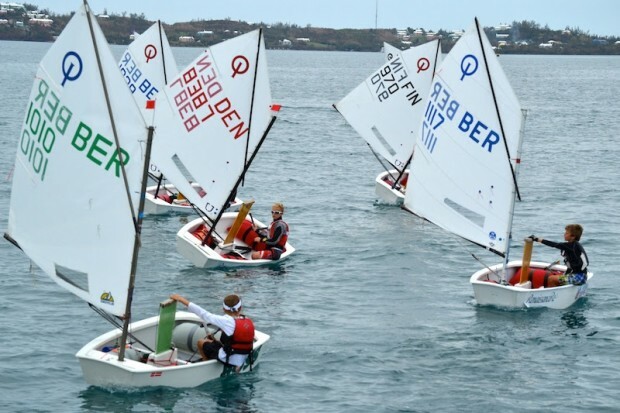 Young Bermudians who are nine or ten years old and not always at the top of the fleet are also gaining experience and appreciation for the sport. Bermudian Micah Thomas was the second sailor across the line in the eighth race of the regatta, while Rian Geraghty-McDonnell placed 10th in the ninth race. The final day of the Renaissance Re Junior Gold Cup will be during the halftime of the Argo Group Gold Cup finals this afternoon.